Last time I wrote about how above-average ocean temperature’s off the coast of New England were contributing to Boston’s historic snowfall. Today I’d like to discuss another factor, as well as the reason for this winter’s warm temperatures in the western US and colder temperatures in the east. A blocking high, or blocking low or any other type of atmospheric block, is a stationary pattern in the atmosphere that causes weather to remain unchanged for days or weeks. When a blocking high is in place, the jet stream is directed around it to the north, produces a ridge. Weather under the ridge is typically very nice, sunny with little precipitation. However, long periods of time under a ridge can exacerbate droughts (which we have across the West in spades.) Blocks are difficult for forecasters as computer models have a tough time predicting when they will finally move. A big reason for this is that they create the conditions that produce themselves, known as a positive feedback loop. From Dennis Mersereau of The Vane, which you should also read. Warm temperatures warm up the surface of both the land and the ocean, which serves to warm the air via conduction, and warmer temperatures are associated with ridges of high pressure. The ridge creates warm air, which warms the surface, which warms the air further, which produces regions of high pressure, which creates a ridge. Ridges forming ridges. This pattern has created the warm-west, cold-east winter we’ve enjoyed (or been stuck in). This winter, high pressure blocks have formed over the western United States. Their exact location has moved around a bit and there have definitely been breaks, but the overall effect of them has been clear. The jet stream has been directed northward and around the high pressure, forming a ridge. The jet stream then dips down across the middle of the country before traveling back north along the Atlantic coast. General pattern for the winter of 2015. With the jet stream in this pattern, a few things happen. Areas south of the jet stream stay warm and areas north of the jet stream stay cool. This is what we have seen, Additionally, the position of the jet stream traveling up the Atlantic coastline provides a path for storm systems to travel. Large scale weather systems travel along tracks where the jet stream moves northward. This pattern, when combined with the warm ocean water, has led to storm after after hitting Boston with heavy snow. 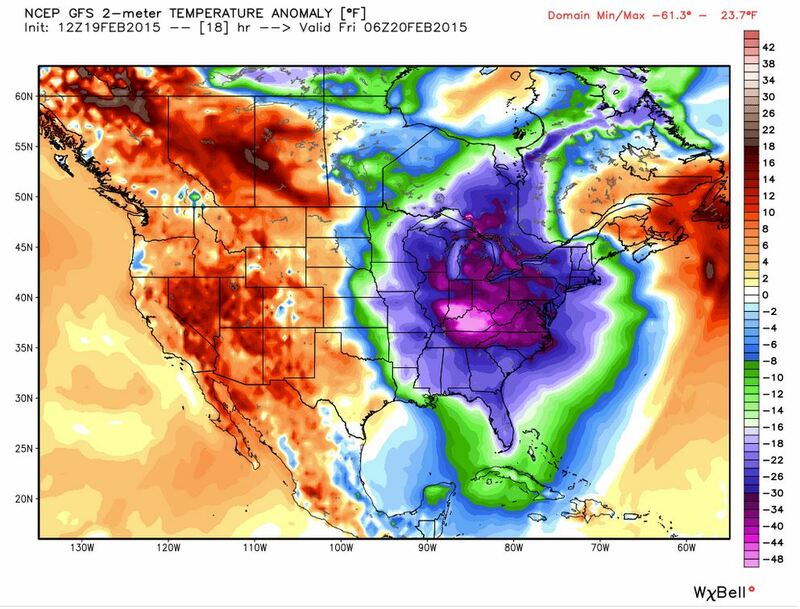 Updated: Temperature Anomaly forecast from the 2/19/2015 12Z GFS Model Run. Valid overnight. Everything east of Texas is below average (except Northern Maine, lucky them). Over 40 degrees F below average in Kentucky! January 2015 Data: Warm to the west, cool to the east. While this pattern has made for some delightful weather in New Mexico, its made things difficult elsewhere. In addition to Boston, its contributing to the California drought situation. Blocks can be tricky things, but they are an important aspect of the climate system. Blocks occur most routinely in the spring and fall and their locations can lead to prolonged, beautiful weather or considerable flooding. Have a good night, more posts coming soon.